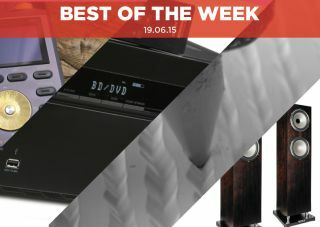 Best of the Week: Yamaha 2015 receivers, Sony STR-DN860 review and more | What Hi-Fi? We start the weekly round-up with news of Yamaha's 2015 Aventage AV receiver line-up, a cool news item of how a turntable's stylus reads a vinyl LP and the release of a new, premium hi-res player, the Lotoo Paw Gold. On the reviews front we have plenty of great products, including Sony's sterling DN860 AV receiver, the impressive Audio Master BT soundbase from TechniSat and another speaker from Tannoy's Revolution XT range, the XT8F. Yamaha has announced its 2015 range of Aventage AV receivers, due for release in late summer/early autumn. The RX-A550 serves as the cheapest amplifier in the line-up, coming in at £500, while the RX-A850 (£900), RX-A1050 (£1000), RX-A2050 (£1500) and RX-A3050 (£2000) occupy the pricier spectrum of AV receivers. All of the receivers feature HDCP 2.2 support for 4K compatibility, with Dolby's Atmos featuring on the RX-A850 and the DTS:X on the RX-A1050. Some cool hi-fi stuff to ease you into the weekend. YouTube channel Applied Science has made a video that shows how a record player picks up information on a vinyl LP – at a microscopic level. The video is nearly 10 minutes long and goes into detail about the processes required to capture the image. It's an interesting watch. You can watch the video over on YouTube. Fancy a hi-res music player with 24K gold plating? Lotoo has answered your call with what it claims is a "reference quality music player for audiophiles", the Lotoo PAW Gold music player. Onboard the player is a PCM1792 DAC chip and LME49600 headphone amp, a USB 3.0 port and compatiblity with SDHC and SDXC cards up to a massive 2TB. "This is a feature-packed amp, with a fantastic performance to boot"
Sony has been bossing the budget AV receiver market of late. Its DN1050 won an award last year, as did the DN1040 before it. The DN860 competes at a lower price band, but the pressure to perform is still there. Whether it's handling music or the latest blockbuster, the DN860's presentation is wonderfully engaging and authoritative, with soundtracks rendered with clarity and precision. There's not much the DN860 can't handle. The omission of Atmos may be a problem for some, but the Sony doesn't miss that feature. With the DN860, Sony has staked its intention to be the top dog. Would-be challengers beware. "The Audio Master BT deserves its place on the top table, for no other reason than it gets the job done"
The last TechniSat product we tested was a digital TV box. So colour us surprised when they turned up at our test tooms with a soundbase. It looks awfully similar to Canton's DM 50 (and that's because it is powered by Canton). Like the Canton, its sound is assertive and well-balanced. There's lots of detail, with dialogue crisp and audible and the bass appropriately loud. We were pleasantly surprised with the Audio Master BT. Not many get a new product right on the first go. "Having spent a considerable amount of time with the new Tannoy XT8Fs, we think they’re arguably the best of the bunch"
We really enjoyed Tannoy's XT6F floorstanders and they're back again with pricier – and larger – siblings, the XT8Fs. And it's another fabulous effort from Tannoy and another high point for its new Revolution XT range. These speakers boast plenty of power, agility, precision, detail, subtlety – the list goes on and on. Match them with a talented system and the performance is spellbinding. Little else can match them at this price.